Wahlenbergia pygmea is a herbaceous perennial, small but very similar in appearance to Wahlenbergia albomarginata. 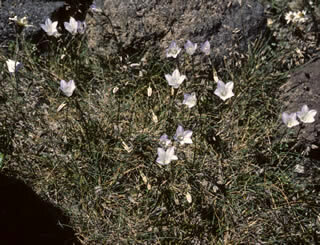 The small leaves are shallowly toothed, 0.6 in (1.5 cm) long. The flowers are pale blue, with a white throat. Wahlenbergia pygmea is found in subalpine to low-alpine scrub, grassland and tussock-herbfields in North Island and South Island, New Zealand.